been hunters as well as farmers. First millennium churches were nearly all of wood and many were replaced by stone buildings in the relatively peaceful and prosperous 12th and 13th centuries. 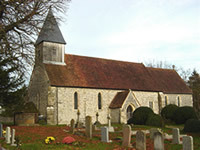 The present Exton church dates from this time, replacing a simpler 9th century building. It is unusual in that it has a ‘weeping’ chancel. That is, the chancel (the area beyond the arch which houses the choir and altar) is not in true alignment with the nave (the main body of the church). 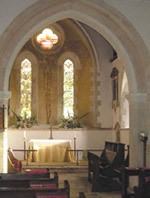 The chancel was built first in 1230 and the nave added in 1350. There is no record why they are not in alignment but perhaps there was once an important grave which no-one wanted to disturb. The stencil of the ‘Tree of Life’ behind the altar was designed by Charles Spooner in the mid 1890s at the same time that he designed the stained glass windows and the screen at the back of the church. The restoration was to commemorate the life of Walter Long of Preshaw – an estate 10 miles to the east of Exton. The Rector still takes service in Preshaw Chapel. The stencil was painted-over for many years until it was discovered by chance in 1995 when the newly-painted east wall began peeling a few weeks after redecoration. This wall painting has now been restored to its former glory. (Charles Spooner was cousin of Revd W A Spooner of New College, Oxford after whom Spoonerisms were named). On the south side of the nave opposite the pulpit is an unusual headstone showing the Angel of Death summoning the scholar from his books. The worn inscription shows that it was erected in memory of Richard Pratt of Preshaw who died in 1780 and his wife, Anne. This is something which the modern pilgrim may also wish to ponder.